The Asian and World Championships for the Cadet and Junior age categories are just around the corner and the official Singapore team has been selected, based on the ranking points accumulated over the past year. We are extremely proud that for the first time we have a total of six fencers qualified for the women’s team, out of a total of eight positions available! Leanne, Heidi and Alexis qualified for the Cadet national team in 1st, 3rd and 4th place respectively, while in Junior category Ywen, Nicole and Joyce were also 1st, 3rd and 4th. It is indeed reflective of the hard work that they have put in over the past season, and we hope that they will do our country proud at the upcoming championships. In addition, we should also acknowledge the rest of the Asgard Elite team who have also put in great effort and contributed towards our growth together as a team. Some only barely missed out on the top 4 positions and we are sure that they will provide the same tough competition for positions when the next ranking season comes around. Calista, Kirsten, Maddy, Megan, Rebekah, Xinyi and Yu Qi have also played a role in creating a successful training environment. The Asian Championships will be held in Dubai from 23rd February to 5th March, while the World Championships will take place in Verona from 1-9 April. Do support our athletes as they do battle for Singapore! In January, some of our athletes also took part in the South East Asian Cadet and Junior Championships held in Kuala Lumpur, Malaysia. Heidi Loo did well to finish with a Bronze and a Silver from the Cadet and Junior events respectively, while Joyce Ng signed off on her final year as a Junior by winning the Junior Championships. Well done! 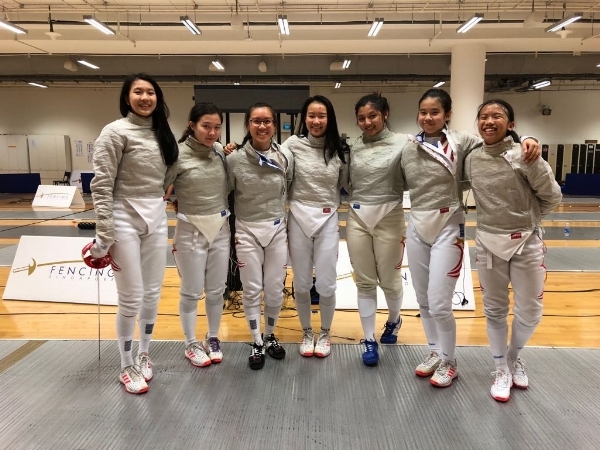 In the Junior team event, Joyce, Calista and Heidi combined with Jessica from Blade Club to form the Singapore team, and they finished comfortably as Team Champions!